Allow me to get weird about the gym for a minute. I love my gym! I mean, I really love it! Planet Fitness in Midtown Memphis is where it's at! My life in jeans in 2019 is turning into a life sweatpants (or leggings, or capris) and I'm not mad about it! 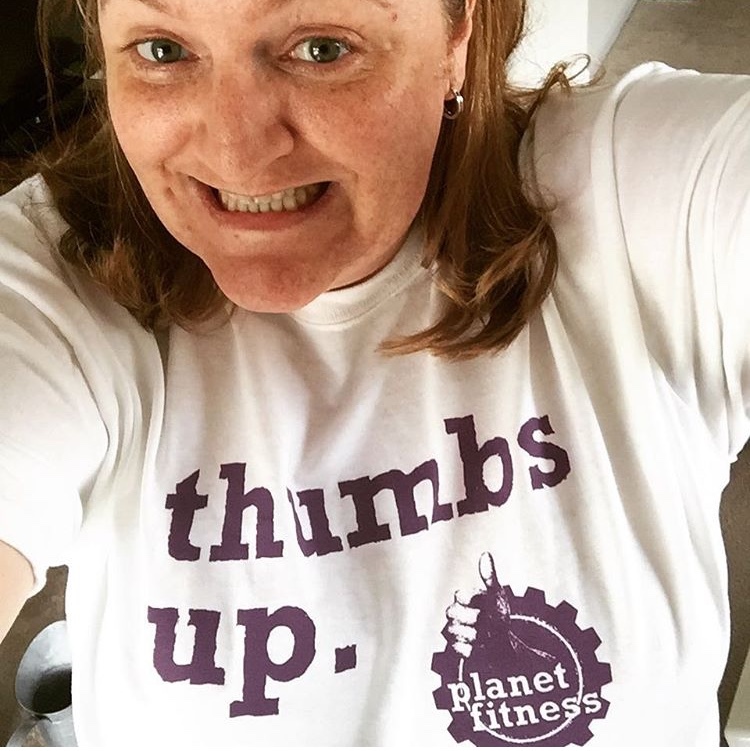 I know there are plenty of people who feel very strongly about Planet Fitness and its "no judgment" policy. I've read the reviews from those who find it to be less of a real gym because PF doesn't offer personal trainers and frowns upon patrons it calls lunks (those who grunt loudly and slam weights). There are also detractors who are put off by the monthly price, arguing it's too cheap! I'm not sure why you would be mad about $10-$20 per month. I'm certainly not. Whatever you think, here's what I know. For my money, it's one of the best places I've ever worked out. I feel comfortable, the staff are all helpful, and every person I've ever met there has been super friendly. And it's that "no judgment" thing that I'm buying into. Every time I walk in, I feel it. I think, "I'm here for me. No one else. Nobody has to walk in my shoes, live my life and answer for my choices. This is the time that I spend taking care of me." And I apply that same logic to every single person in the building, from the woman burning up the elliptical in front of me, to the dudes lifting weights across the room. We're all there for ourselves, trying to do and be better. I secretly support them in my head. I like to think they're sending out that same vibe in my direction. Maybe they noticed my clothes are a little looser. Maybe they see I'm not huffing and puffing as much as I increase the speed on my treadmill. And maybe they'll quietly cheer me on when tomorrow I lift heavier weights than I did last week. A few weeks ago I saw a woman in the ladies locker room making eyes at herself in the mirror. She turned around and gave herself an approving over-the-shoulder look and snapped a picture with her cell phone. She saw me watching and started to laugh. I giggled along with her. I wanted her to know I might not be checking myself out in public, but I don't care if she does. She blushed at being caught and regaled me with the story of her journey. The first words out of her mouth, "I'm sorry, but I've lost 100 pounds!" "That's fantastic!" I said, "You are beautiful!" She seemed genuinely thrilled to hear the compliment and swelled with pride for her success and what I can only imagine was a hard-fought victory. It was so sweet and so inspiring. She did it! And I know I can do it, too. And true to my resolutions this year, I visited two different Planet Fitness locations on my first out-of-town trip of the year.